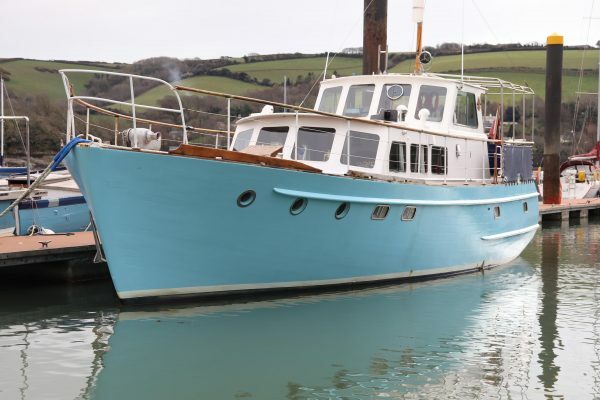 Dagless Fleur de Lys designed by Francis Jones and built by Dagless in 1966. 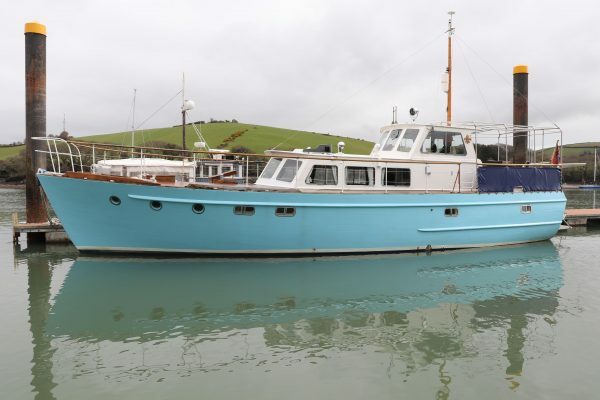 This is one of the 52′ models, the most common size of Fleur de Lys yachts and for good reason. 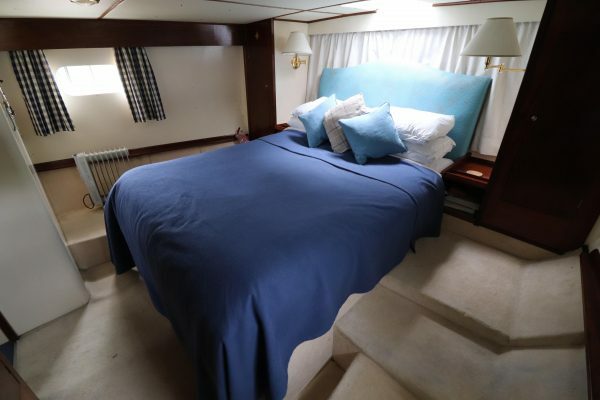 They are large enough to offer very comfortable living space for owners and guests, ample deck space to enjoy the weather and with enough power and range to be able to cruise extensively in safety. 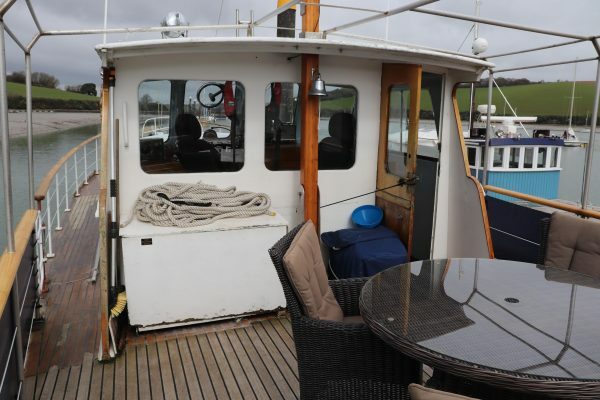 They offer a lot of capability and comfort for a boat of their size without having to go to a larger and more expensive to run motor yacht. 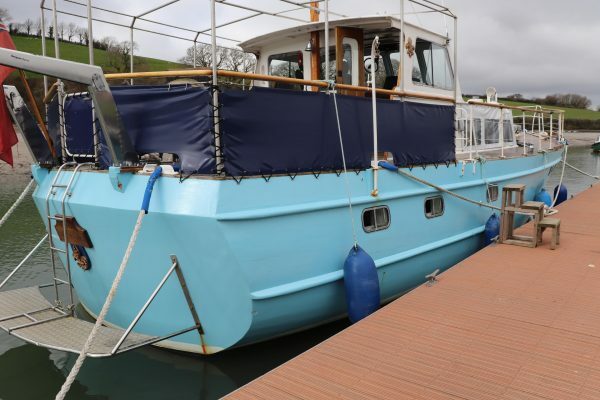 In the previous ownership she had a major refit with a complete new aft deck and transom, and a new fit out in the aft cabin giving a very large double berth. 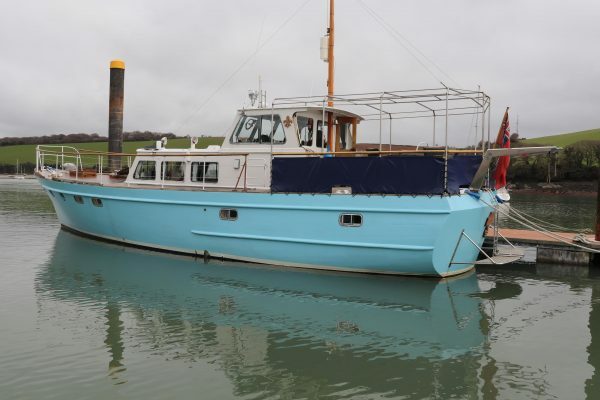 The present owners have used her as a live aboard with local trips down the coast and fitted a new Beta Genset in 2016. 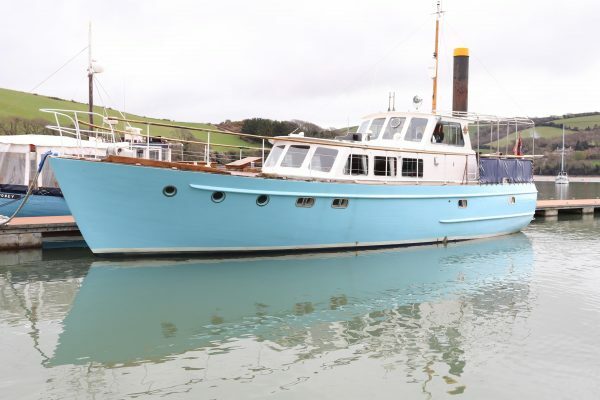 She has been slipped every year and the machinery and systems have been kept in good working condition. 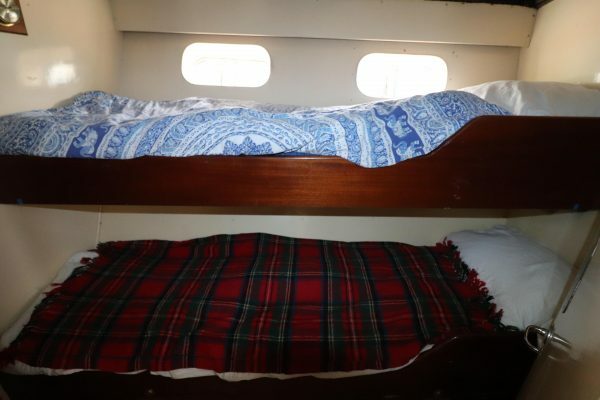 Her layout is unusual offering 4 sleeping cabins with a total of 8 berths including 2 large doubles. 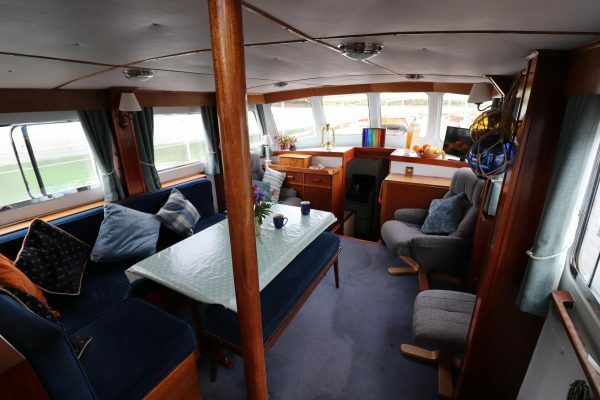 With the covered aft deck and spacious deck saloon she makes a wonderful cruising boat with ample space for guests to join. 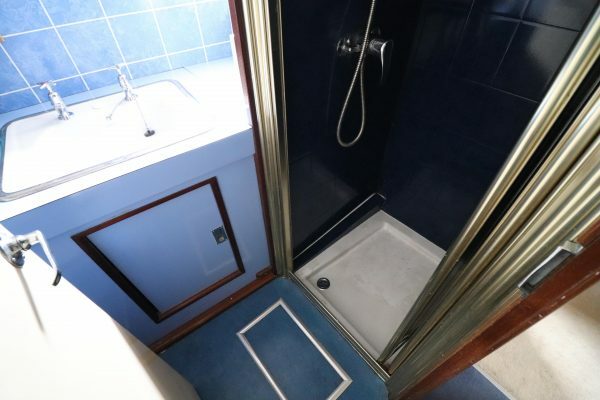 A nice example in good working condition. 2013 survey available. Planked in Iroko fastened to sawn oak frames with galvanised screws. Steamed Oak intermediate timbers fastened with copper rivets. 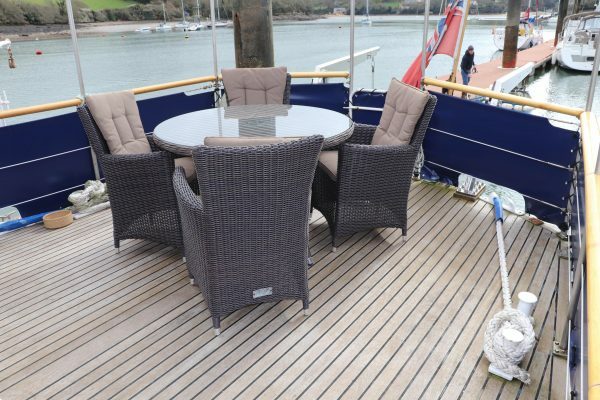 Sawn oak floors across the centreline. 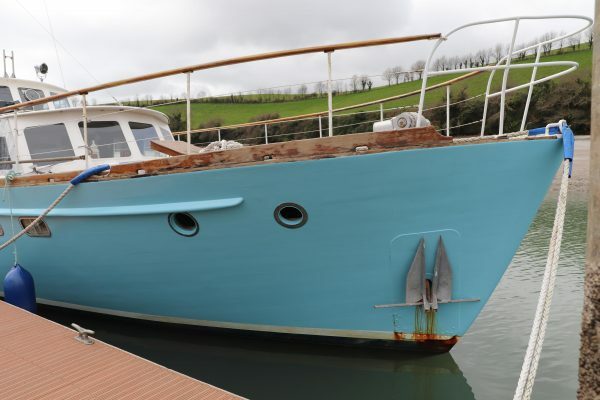 External iron ballast keel, keel bolts last checked in 2009. Internal iron trimming ballast. 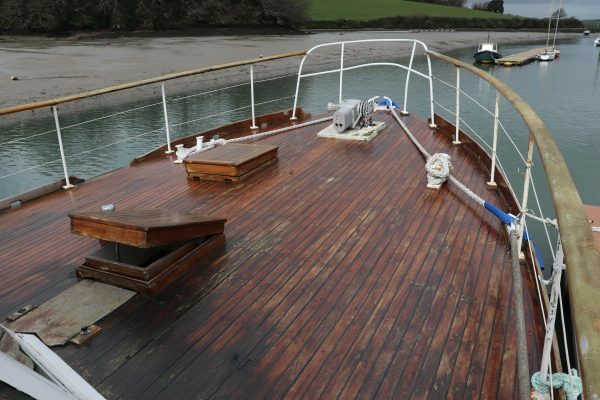 Marine plywood deck on Iroko deck beams, overlaid with a straight laid Iroko deck, screwed and glued to the plywood with payed seams. Painted galvanised hand rails all round with a varnished mahogany capping rail. 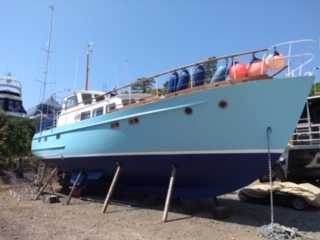 Marine plywood superstructure, sheathed externally and painted. 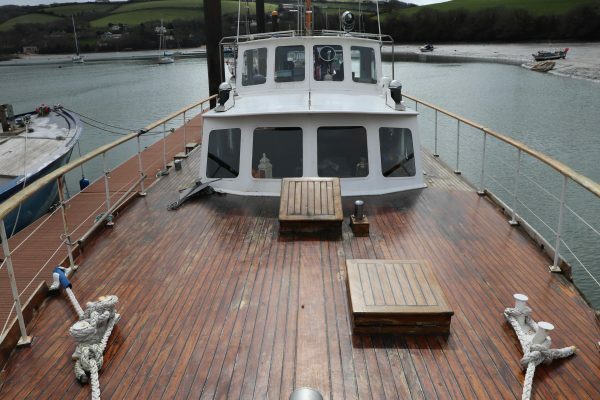 Sheathed plywood coachroof deck and wheelhouse roof. Aluminium framed windows. 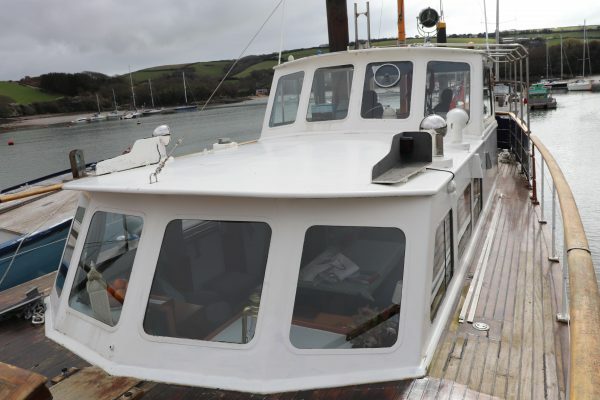 Small deck stepped varnished wooden mast to carry lights, antennas, aerials and radar reflector. 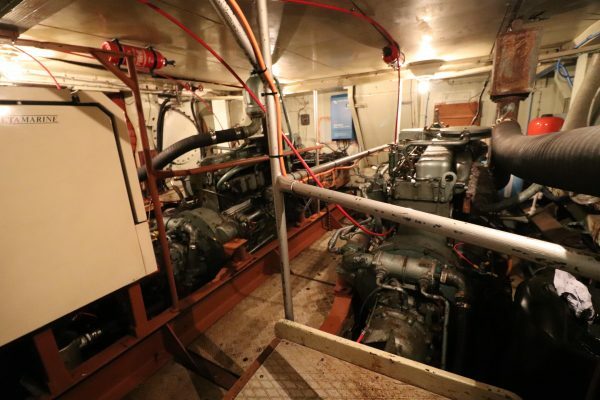 Twin Perkins 6354 120hp 6cyl diesels, serviced regularly and running smoothly. 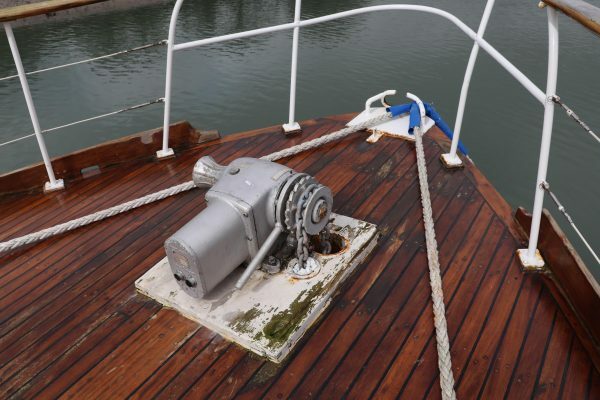 Single lever controls to Borg Warner Velvet drive gearboxes and stainless shafts to fixed 3 blade bronze propellers. 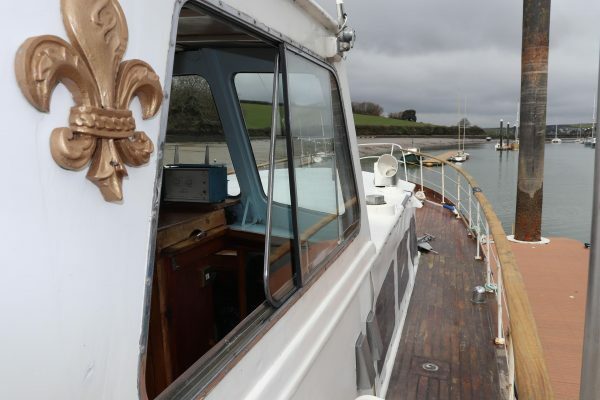 8 knots cruising speed, 10 knots max. 2 x steel fuel tanks in the engine room, total capacity of 2000 litres. 2 x galvanised steel water tanks, total capacity of 2000 litres. 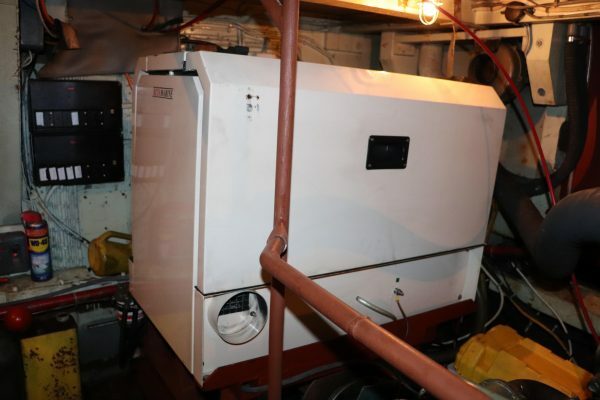 Beta Marine 10kva diesel generator installed in the engine room in a sound proof box. New in 2016. 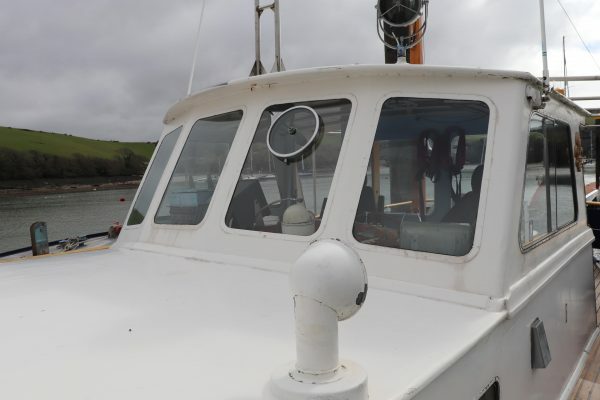 Pair of Vosper Mini Fin hydraulic stabilisers, automatic operation and in good working order. 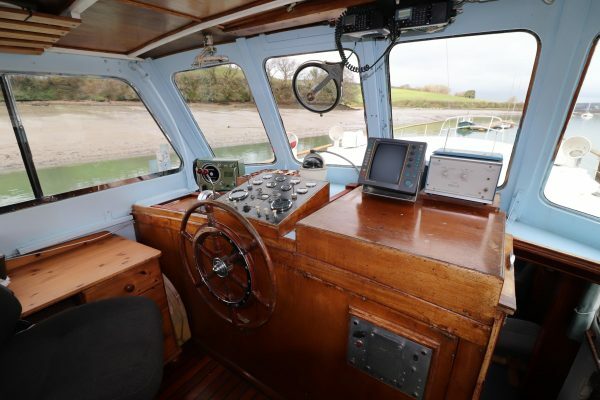 Wheel steering with rods and gears to a single centreline rudder. 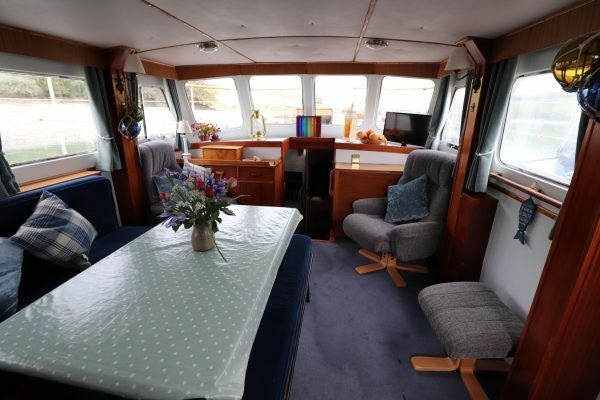 A very impressive layout giving 4 separate sleeping cabins plus a deck saloon, galley and heads. 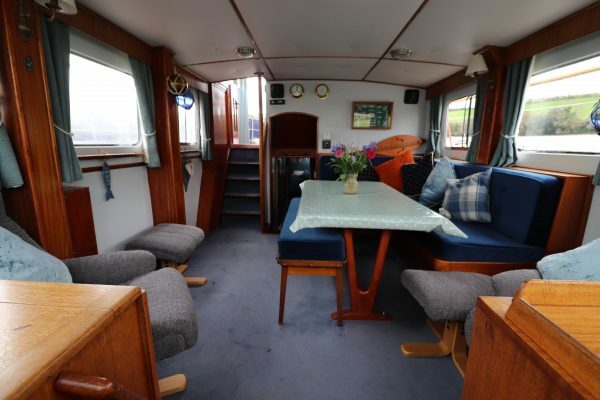 Starboard side steps down from the wheelhouse into the deck saloon, varnished mahogany table to port with fixed L-shaped seating around it. Storage beneath the seats. 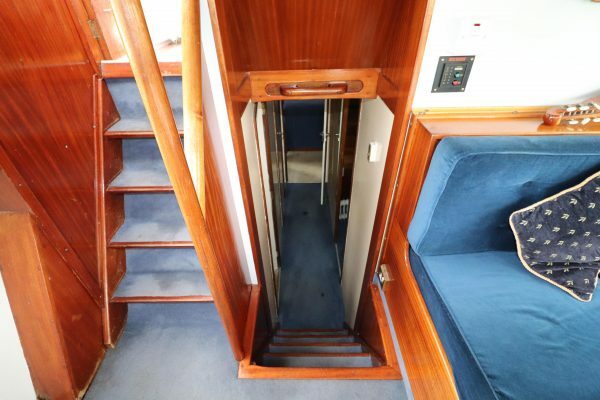 Centreline steps going forward with the galley to port and walk in twin cabin to starboard. 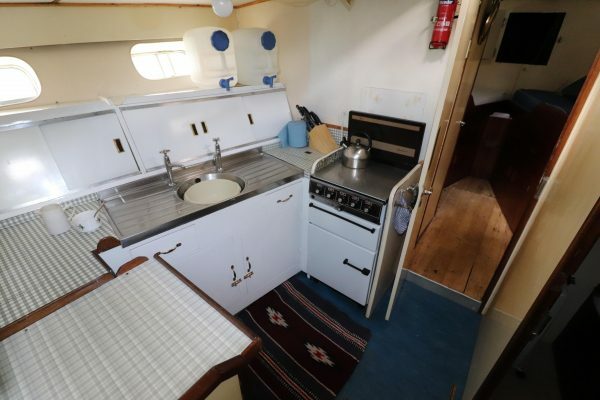 Galley has a 4 burner gas stove with oven and grill, Single stainless sink with draining board and hot and cold pressurised water. 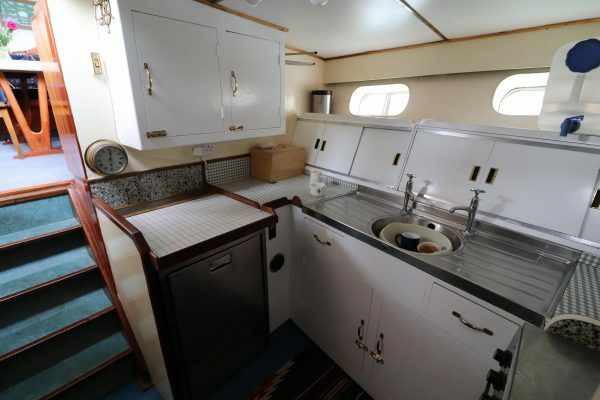 Masses of storage space and original formica work tops contemporary to the boat. 24 volt stainless steel fridge recently fitted. 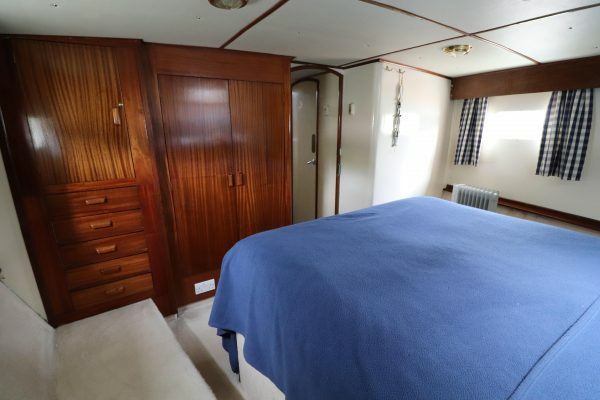 Opposite the heads is a twin cabin with two good size single berths, hand basin and storage locker. 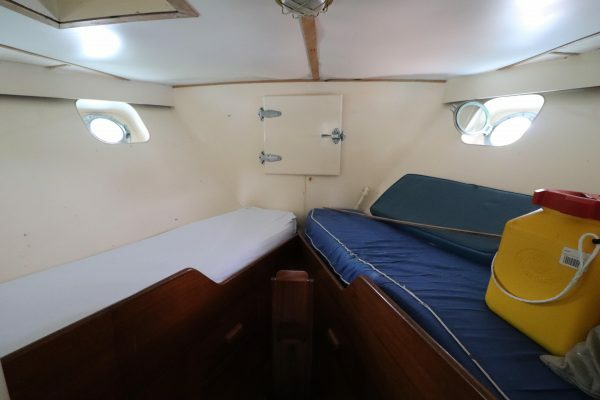 Forward cabin with V-berths, large storage lockers under and a hatch into the anchor locker in the bow. 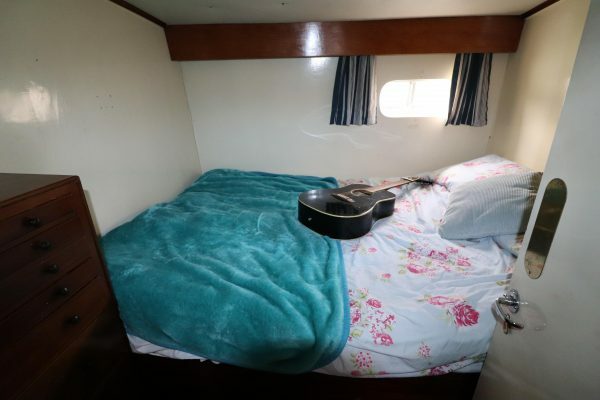 Large walk in storage lockers by the forward cabin. 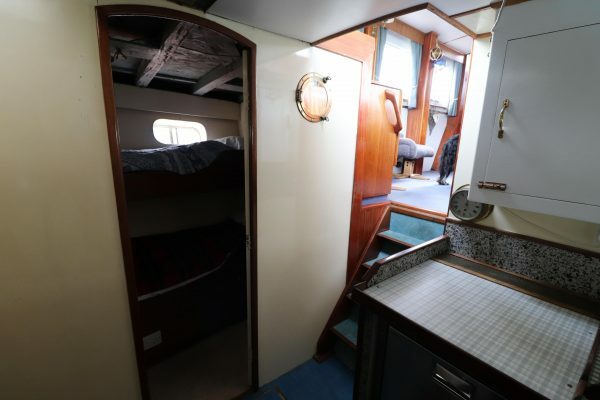 Going aft from the deck saloon there is a double cabin to port with a hand basin and storage locker. 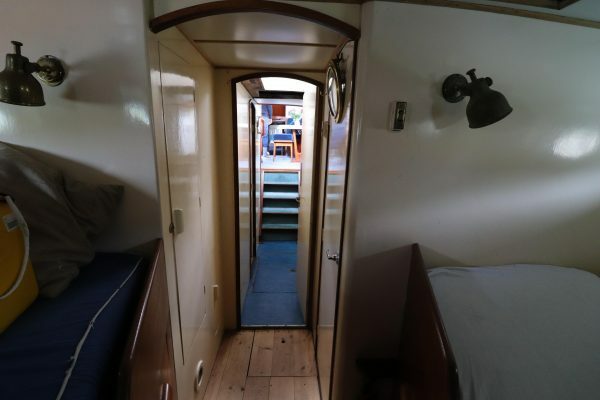 Entrance to the engine room on the starboard side with a small workshop area. 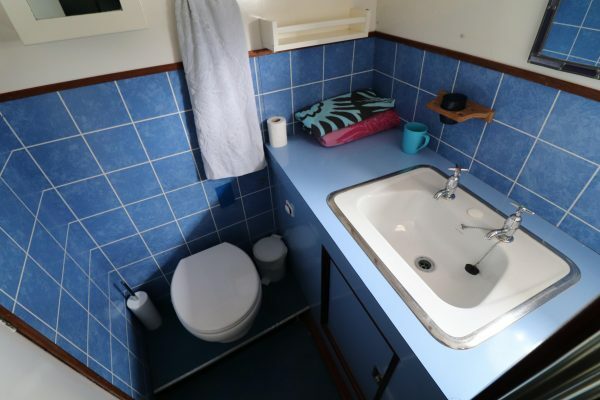 Moving aft there is a heads compartment to starboard with an electric sea toilet, hand basin and walk in shower with pressurised hot and cold water. Heads has a black tank receptacle. 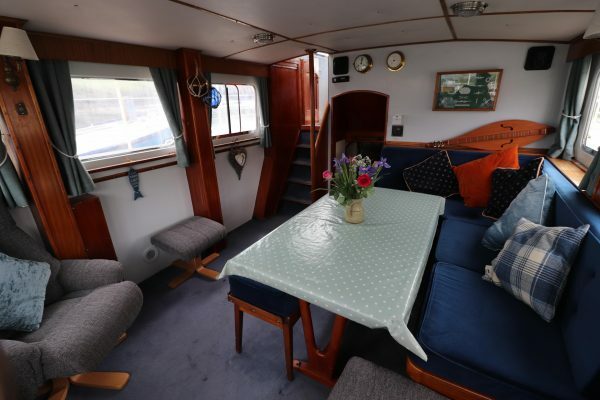 At the aft end is a large owners cabin across the full beam of the boat with a large centreline double berth, plenty of space around the berth and large wardrobe type lockers in original varnished joinery.